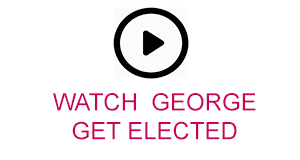 Find out more about Alan, George and Sophie below. You can also watch the moment they were elected by clicking on tiles on the right of the page. Stay tuned for more updates from all three before they officially take office in July. Alan Lofthouse, President Education Elect - Alan is originally from Yorkshire and has settled in Richmond, he previously graduated from Teesside University with a BSc (Hons) Applied in Sport and Exercise and he's currently completing an MSc in Sport Rehabilitation. Over his five years here he's been heavily involved in Teesside University Cricket Club and The Sport Science and Medicine Society, serving as Chair of both. 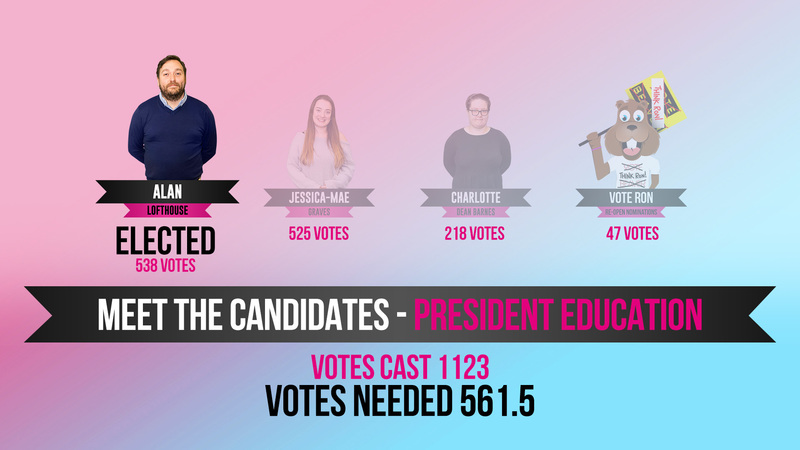 "I couldn't quite believe it when I first heard I had been elected President Education and it did take a while to sink in! I'm really looking forward to working with students and the University to make education at the University great again!" Alan says "I also can't wait to work with Sophie and George who I know will be great colleagues." George Reeves, President Activities Elect - George is originally from Aldershot but moved around a great deal as a child while his father was serving in the armed forces. The family finally settled in Whitby when George was 12. He graduated from Teesside University with a BEng in Chemical Engineering and is currently completing an MSc in Energy and Environmental Management. He has served as Chair of Athletic Union and Captain of The Men's Rugby Team over the past 12 year having been heavily involved in the club throughout his time studying here. "You couldn't have scripted the result of the President Activities election and I'm elated to have won after such a tight race. I can't wait to get in to the job and start making my mark, my priorities include improving relationships between governing bodies and sports clubs as well as improving the networking between clubs and societies." 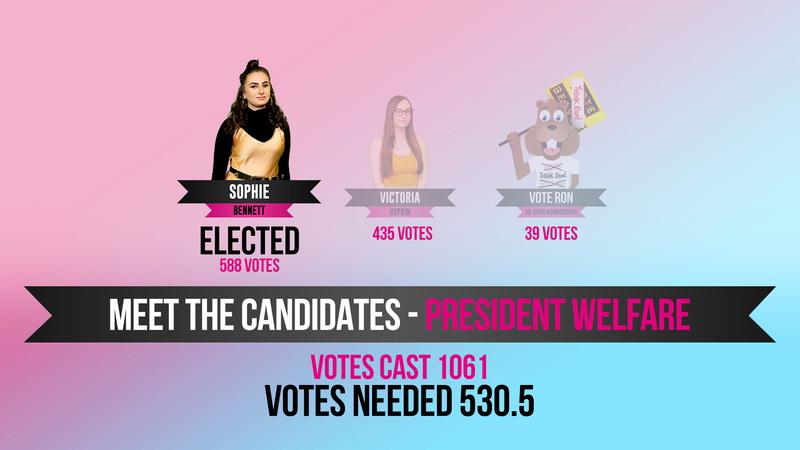 Sophie Bennett, President Welfare Re-Elect - Sophie is originally from Darlington and will serve a second term in the role after being re-elected. 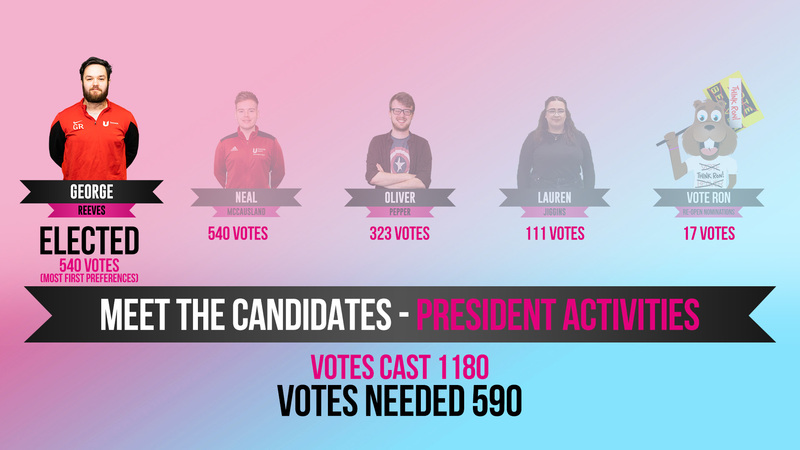 Before originally taking office in July 2018, she had graduated from Teesside University in Sport and Exercise Coaching and was a familiar face to many students from her time working as a member of bar staff for the Students' Union. She also worked as a Course Representative and was heavily involved in several sports clubs, she continues to play for Women's Rugby. "I thought it was a great feeling when I was first elected last year to be given a second year in the role and the chance to build on all of last year's work is such an honour. I'm looking forward to working closely with Alan and George on a wide range of issues around students' mental and physical health, wider wellbeing and other aspects of their experience here at the Uni."